The ClarityHD Micro competes with the the other boxy speakers in every area that matters - design, sound, and presumably price. But it's the Monster ClarityHD Micro's functionality that set it apart from normal tiny speakers. Inside the small speaker, you'll find a noise-cancelling mic which allows the device to work as a handsfree speakerphone and has a voice-activated command system. We didn't get a chance to test this command system in the noisy showroom, but we've heard if someone decides to call you, your bluetooth device will pull the name from your contact list and tell you "So and So is calling. Answer or ignore?" to which you can say "answer" to answer or "ignore" to, you guessed it, ignore. You can list contacts as your favorites, and then tell your Monster ClarityHD Micro to call them, you can check your battery level, you can see if your phone is connected, and more, all through voice-commands. The Clarity HD Micro can also simply serve as your everyday speaker. If you don't have a bluetooth-enabled device or just would rather not sacrifice your audio quality for a wireless connection, you can connect any device through a 3.5mm audio input. Personalization is the name of the game here, and Monster not only allows you to personalize the voice commands but also the look of the device. The ClarityHD also comes with a few interchangeable front and rear grilles, so if black's not your thing you can swap it out for red, or aqua, silver, green or white. While the predecessor is still on the market, they showed us the difference in volume and it was substantial. At peak volumes the ClarityHD Micro might loose a bit of its bass (if it really ever had bass to begin with), but overall it sounded much stronger. Makes its predecessor look a bit like a generator, don't you think? The ClarityHD Micro is a decent sized unit, and while it doesn't exactly live up to its "micro" nomenclature, it is small enough to warrant a wrist-strap. The device is surprisingly lightweight so it's not impossible to imagine carrying the thing to the park, or into the kitchen, or wherever you tend to maybe want to carry speakers. 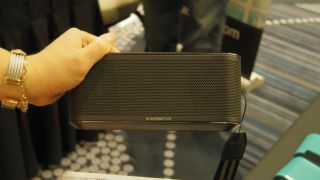 All in all, it feels like a lightweight version of the beatbox portable, which costs a whopping $449.95. Still no word on pricing or release date, but when we'll update as soon as possible.